KOTA KINABALU (WEDNESDAY) – A Strategic Management Plan of the Imbak Canyon Conservation Area (ICCA) is in the making and the importance of the stakeholders involvement in validating the said plan is vital. This was disclosed by the Director of Yayasan Sabah, Datuk Sapawi Bin Haji Ahmad during the ICCA Management Plan Stakeholders’ Validation Workshop held today at the Pacific Sutera, Kota Kinabalu. Datuk Sapawi further reiterated that the main objective of the workshop was to engage stakeholders to actively participate in discussions over all relevant issues and to incorporate them into the newly formulated Strategic Management Plan to be operational from 2014 to 2023. Hence, according to him, Yayasan Sabah Group has adopted the participatory approach to the development of Management Plans for conservation areas under its purview. “The preparation of the Imbak Canyon Management Plan has gone through many processes to reach to this final stage,” he added. 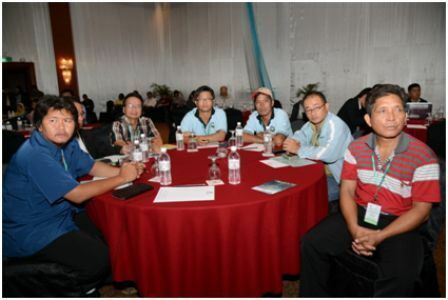 “Through the workshop, the stakeholders would understand the whole intricacies of the first Imbak Canyon Strategic Management Plan, and I hope that all participants would take this golden opportunity to capture all the relevant interests, challenges and issues so that we would at last, have a much more comprehensive and cohesive Strategic Management Plan for ICCA,” added Datuk Sapawi. His speech was read by the Senior Group Manager, Human Resource & Corporate Services of Yayasan Sabah Group, Puan Hajah Rosmawati Haji Lasuki. “This workshop will, therefore, assist us in learning from each other and together creating a better Strategic Management Plan for ICCA while enhancing and understanding issues pertaining to stakeholders’ value in relation to the planning for the sustainable development of ICCA,” he added. Yayasan Sabah Group is responsible in managing the ICCA for research, education, training and recreation. As direct and indirect spin-offs from this great responsibility, Imbak Canyon, which covers 300 square kilometres was designated as a Class I (Protection) Forest Reserve in 2009. Initial exploration findings from three expeditions in 2000, 2004 and 2010 reported that Imbak Canyon is rich in flora and fauna biodiversity including medicinal plants. On 29 June 2011, Yayasan Sabah Group signed a Memorandum of Agreement with PETRONAS, Malaysia’s National Oil Company. The Yayasan Sabah-PETRONAS Imbak Canyon Conservation Partnership strives to position ICCA as a centre of learning for the indigenous community in biodiversity conservation and sustainable use of natural resources; as well as gene bank conservation and the exploration of pharmaceutical and biotechnological potentials. Under the Partnership, PETRONAS provides sponsorship of RM6 million for the development of ICCA, specifically to implement eight core programmes, namely Environmental Education, Public Awareness, Community Outreach, Ethno-Forestry Study and Documentation, Research, Capacity Building, Formulation of Imbak Canyon Management Plan and initial works towards the construction of Imbak Canyon Studies Centre. “The implementation of the eight core programmes is carried with the objectives of managing ICCA as Protected Area and promoting sustainable use of natural resources; training the local communities in biodiversity conservation; enhancing capacity building among staff of Yayasan Sabah Group, PETRONAS and other stakeholder agencies besides formulation of the ICCA Management Plan and the establishment of relevant field facilities for education and research,” explained Datuk Sapawi. “This workshop is a follow up of a previous stakeholder consultation workshop held in June 2011 which had 120 participants conducted to provide a venue for stakeholders, to identify, discuss and express their views on issues to be addressed in the ICCA’s first Strategic Management Plan. Similarly, a Research and Tourism Workshops were held in 2013 as well as various internal stakeholder workshops and dialogues with the local communities surrounding ICCA as part and parcel of acquiring substantial feedbacks and inputs on relevant issues to be accorded in the fourth coming ICCA Strategic Management Plan,” he added. On a bigger scale of things, Datuk Sapawi also stressed on the importance of teamwork among the stakeholders which he described as being crucial in achieving the project’s objectives. “The participants of this workshop are drawn from all walks of life, but their contributions are appreciated and taken into account when finalising the Management Plan,” added Datuk Haji Sapawi. 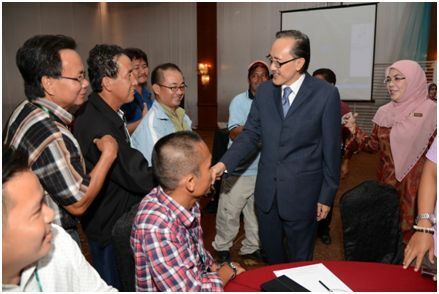 About 150 participants attended the workshop, namely environmental experts, heads of government departments and agencies, NGO’s, members of the Sabah Tourist Association, tour operators, village heads surrounding the ICCA and members of the Village Security and Development Committees. State Minister of Tourism, Culture and Environment, Datuk Seri Panglima Masidi Manjun officiated the workshop.